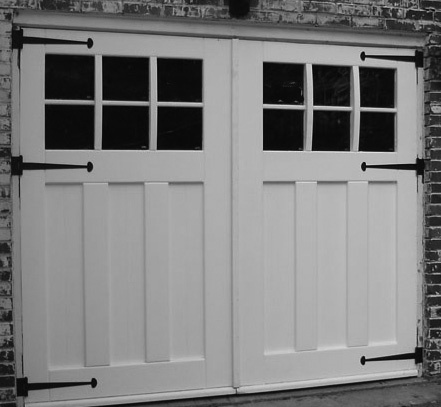 These sweet white carriage house doors feature the simple and elegant 18″ Suffolk Strap Hinge and Square Pintle. They install to a surface where the jamb and door face are flush. They are available as a strap hinge set of three hinges and three pintles, as shown below (two sets shown below). For smaller doors or gates, they can be purchased as a pair of hinges and pintles. For carriage house doors and garage doors where a decorative, rather than functional, solution is needed, we offer the Suffolk Decorative Hinge Front in either 12″ length or 18″ length. Sold in pairs. ← Customer Questions: What hardware to use for a double out-swinging gate?